It’s official! 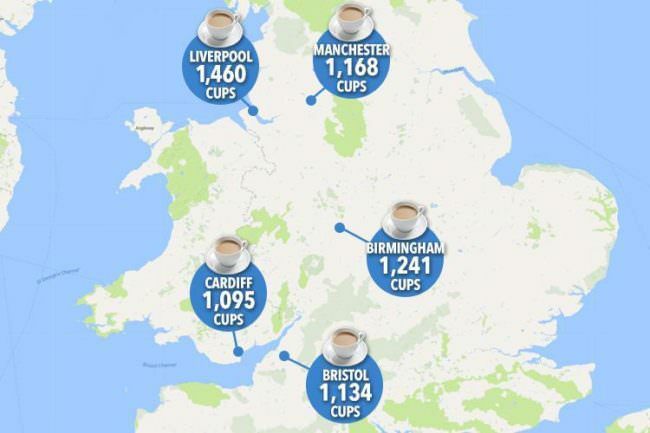 Liverpool has been named the tea drinking capital of the UK, while Edinburgh came out on top in terms of coffee consumption. After in-depth research into the hot beverage habits across Britain carried out by boiling water systems specialists, Redring, it was unveiled that the average Liverpudlian will consume 1,460 cups of tea each year, while fruit/herbal tea was most favoured in Glasgow. Edinburgh topped the list for coffee consumption with an average of 1,095 cups per year. English breakfast and instant coffee both maintained the biggest market share even with the huge increase in recent years of alternatives and artisan products. When it comes to espresso, Manchester led the way in drinking more espressos than anywhere else, while Liverpool come top when it cam to cappuccino. A spokesperson for Redring said: “Brits are famous for their love of tea. It would seem many of us can’t function without it. “Despite the market being flooded by extravagant blends and flavours, it appears good old builder’s tea is what we reach for. “Similarly, the research shows that despite the influx of coffee shops on every high street across Britain, you can’t beat a hot cup of instant whether you’re at home or in the office.